LPC possesses a private up-to-date lubricant production refinery in Aspropyrgos, Attica. The refinery’s annual capacity is 40,000 tons of mineral oils. In LPC’s refinery, a wide variety of base lubricants (SN 85, SN 150, SN 500, SN 2000) is produced, which cover the needs of the market. Meanwhile, it is the only plant in Greece which produces the heavy mineral oil fraction “Bright stock” (SN-2000). The company produces and packages about 50.000 metric tons of finished products to be used as lubricants. In its production units about 200 different types of lubricants are produced covering every need for lubrication of any type of vehicle and machinery. The finished product unit (Μ-600) is in charge of blending and packaging. After the products are packaged, they are transported to modern electronically monitored warehouses of the facilities where they remain until their placement in the market. The company’s primary choice is the minimization of natural resources and the most complete recycling possible of processed liquid waste. 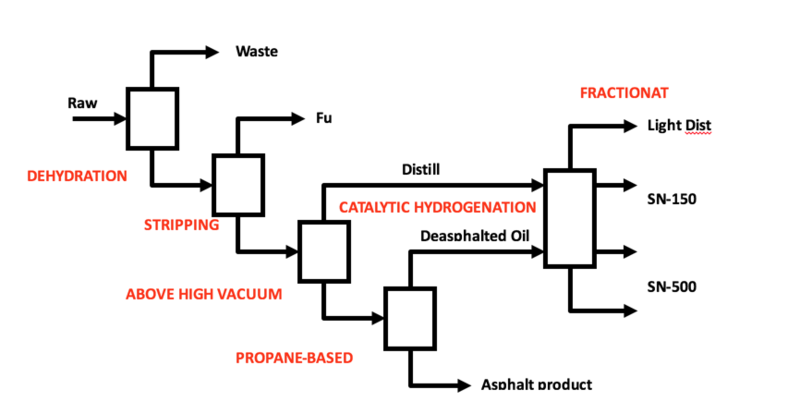 LPC invests in the application of new liquid waste processing technologies (such as membrane hyperfiltration, use of advanced oxidation methods etc). Within this framework and mentality, the operation of the exemplary biological cleaning unit at the Aspropyrgos refinery has been a complete success as well. In cooperation with the competent departments of the company, new products are developed which meet the highest standards of the ever-developing lubricant market, while they are checked through all stages of production, packaging and storage, completely safeguarding their quality. The Safety, Health and Quality department as well as the highly-equipped and certified Chemical unit are in charge of ensuring the quality of all the produced and traded products of the company.